Leaves hair soft & silky with beautiful sheen. 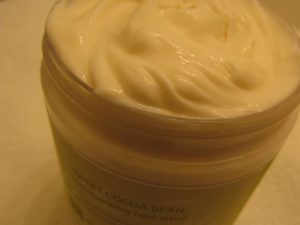 This is a super concentrated moisturizing cream that is loaded with natural oils and butter. distilled water (aqua), theobroma cacao (cocoa) seed butter, prunus amygdalus dulcis (sweet Almond) oil, behentrimonium methosulfate, cetearyl alcohol, olea europaea (olive) oil, elaeis guineensis (palm) oil, euphorbia cerifera (candelilla) wax, wildflower honey, cetyl esters, panthenol, hydroxyethyl cellulose, phenoxyethanol, caprylyl glycol (a paraben-free preservative), vanilla planifolia (vanilla) oil, coffea arabica (coffee) seed oil, theobroma cacao. Apply just a small amount throughout damp or dry sections of hair for healthy conditioning and moisture. *Use it as leave-in to naturally condition dry locs,curls & waves. *Can also double as a body butter/whip!